Un sobrio análisis de la situación política y económica del país acompaña el retrato que el respetado semanario inglés realiza de Cristina Kirchner, con pistas sobre sus eventuales respuestas a los desafíos que enfrentará si sucede a su esposo en el sillón de Rivadavia. The president’s wife seems certain to succeed him, but will she cool an overheating economy? ABROAD she is sometimes compared to Hillary Clinton. At home she likes to invoke Eva Perón. Either way, Cristina Fernández de Kirchner seems certain to win Argentina’s presidential election on October 28th, and thus to succeed her husband, Néstor Kirchner. If the polls are to be believed, she will win by a large enough margin to avoid the need for a run-off ballot (see chart 1). If so, she will become the first woman to be elected as Argentina’s president. (Isabelita, Juan Perón’s third wife and his vice-president, briefly succeeded her husband before being ousted by a military coup in 1976.) She likes to point out that she has been a senator since 1995 and so was a national political figure when her husband was a mere provincial governor. But assuming she wins, she will owe her victory to his—or their—decision that he would not seek a second consecutive term and that she would run in his stead. Mr Kirchner has presided over Argentina’s vigorous recovery from a horrendous economic, financial and political collapse in 2001-02. 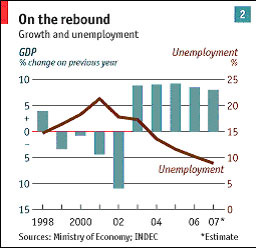 Thanks to four years of annual economic growth of over 8%, poverty and unemployment have halved since he took office in 2003 (see chart 2). For that, the president can take only some of the credit. He inherited a capable economy minister in Roberto Lavagna, who had put in place some coherent policies. Idle factories whirred back into action while world prices climbed for Argentina’s farm exports. But Mr Kirchner’s brutal treatment of holders of some $81 billion in bonds on which Argentina defaulted in 2001 ensured that debt payments did not become a drag on growth. He quelled a riotous movement of unemployed protesters with a mixture of handouts and diatribes against the IMF, big business and the privatisations conducted by Carlos Menem, a right-wing Peronist, in the 1990s. After winning control of Congress in a mid-term election in 2005, Mr Kirchner dumped the prudent Mr Lavagna. Since then, he has deliberately allowed the economy to overheat. Interest rates are negative in real terms, while the government has opened the fiscal tap (so far this year central-government current spending has risen by an eyepopping 48% in nominal terms). As a result, inflation is rising fast. The government has responded with price “agreements” (ie, controls) and blatant manipulation of the official inflation index. The real figure, suggested by the numbers published by two provinces, may be up to twice the official one (see chart 3). Similarly, Mr Kirchner’s populist approach to energy—energy prices in Argentina are only 60% of those of its neighbours—has led to occasional shortages. Meanwhile, his government has been hit by several corruption scandals this year. Nevertheless, Mr Kirchner is still popular—more so than his wife. So why did he decline to stand for re-election himself and impose his wife as the Peronist candidate? He has never fully explained. Some opponents reckon that his intention is to return in four years’ time, thus prolonging the family hold on power. Insiders say that he believes that Ms Fernández’s skills are better suited than his own to the tasks now facing the country. “She can sit down and bargain without having been the person who screwed over anyone,” says an official who is close to her. Ms Fernández has given little away about her intentions. She has maintained a big lead in the opinion polls while doing little campaigning. Like Mr Kirchner, she does not submit to press conferences or interviews by Argentine journalists. She has spent much of the past few months travelling abroad—something her husband has done very little. She has unveiled few policy plans and held few rallies. But she is a better public speaker than Mr Kirchner, feisty and articulate where he is awkward and uncommunicative. “I identify with the Eva Perón who clenched her fist at the microphone, not with the…good fairy who arrived with Perón to hand out work and [women’s] right to vote,” she told El País, a Spanish newspaper. But some Argentines say she lacks the common touch of the always-remembered Evita. Of middle-class background, Ms Fernández and Mr Kirchner met at university, and worked as property lawyers in Santa Cruz, the Patagonian province of which he became governor. Nowadays Ms Fernández sports designer handbags, trademark white suits and, it is said snidely, collagen-enhanced lips. That she has not been pressed harder in the campaign says much about the hapless opposition. The Radical party, the traditional opposition to the dominant Peronists, had the misfortune to hold (and lose) power during the economic collapse of 2001. Even though they were implementing Mr Menem’s policies, Argentines blamed the Radicals rather than the Peronists for the debacle. The party has shrunk and splintered: Julio Cobos, a Radical who is governor of Mendoza province, is Ms Fernández’s running mate. Her main rivals are Mr Lavagna, who presents himself as an “alternative” to (rather than an opponent of) the Kirchners, and Elisa Carrió, a former Radical who offers little except a campaign against corruption. Several others have struggled to break into double figures in the polls. Ms Fernández not only basks in her husband’s popularity. She enjoys some of the advantages of incumbency. She has use of the presidential jet and friendly coverage on state television. Her opponents say they have had trouble raising money because some would-be donors have held back for fear of a punitive tax audit. The opposition’s divisions also help her: she can avoid a run-off provided she gets 40% of the valid votes and leads her closest rival by ten points. 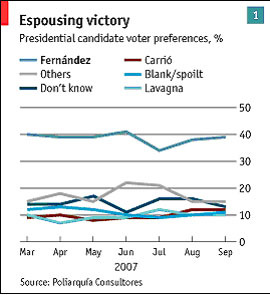 Assuming she wins, will Ms Fernández’s policies differ from those of her husband? Her political views, like Mr Kirchner’s, were forged in the Peronist left of the 1970s: nationalism, a sizeable state role in the economy and hostility to the armed forces. But aides point to differences of emphasis and experience. Ms Fernández has been her husband’s de facto floor leader in Congress over the past four years. Unlike him, she is a negotiator, they say. While Mr Kirchner’s opponents accuse him of autocratic tendencies, Ms Fernández’s defenders present her as a champion of democratic institutions. On that, however, there are disagreements. She championed bills to give the presidency control over judicial appointments, and to reallocate congressionally-mandated spending at will. Yet she also supported moves to reform the Supreme Court that have the backing of NGOs. The clearest difference is in foreign policy. Mr Kirchner showed no interest in it, beyond an alliance with Venezuela’s Hugo Chávez, whose government has bought some $5 billion in Argentine bonds and has swapped diesel fuel for farm machinery and other products. On her trips abroad, Ms Fernández has courted businessmen. She is likely to seek better relations with the United States and Europe, but without breaking with Mr Chávez. She has said she plans to renegotiate the $7 billion that Argentina owes the Paris Club of rich-country lenders—but rejects the club’s requirement that the IMF be involved. It is not clear whether she would seek to ease Argentina’s access to world financial markets by reaching a deal with the holders of bonds (worth $20 billion at face value) who did not accept the debt restructuring. One big doubt is whether she will take the steps, eschewed by Mr Kirchner, needed to engineer a soft landing for the economy. 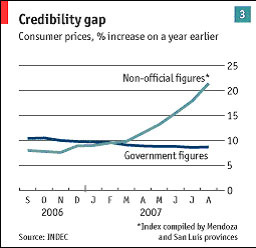 Once inflation exceeds 20% and energy rationing reaches homes, Argentines will surely demand solutions to these problems. But these involve unpopular measures for which the public has not been prepared. If inflation is to be curbed, rather than covered-up, interest rates will have to rise, the growth of public spending will need to be checked, and the peso be allowed to appreciate. Energy tariffs will have to rise, some of them steeply. A second doubt concerns Mr Kirchner’s role—assuming it is his wife to whom he passes the presidential sash on December 10th. He has vowed to remain in politics; although Peronism is a mosaic of warring factions, he controls its most powerful political machine. So Argentines will be in little doubt that if they vote for Ms Fernández they will be getting two Kirchners for the price of one—a somewhat inflated price, opponents would doubtless say.